All told, 3,300 troops of the 1st Armored Brigade, 1st Cavalry Division from Fort Hood, Texas, will bring 2,500 pieces of equipment across the Atlantic Ocean. The formation will relieve the 2nd Armored Brigade of the 1st Infantry Division, which will return to Fort Riley, Kansas. The equipment arrived by ship in Antwerp, Belgium, over the weekend, where it is still being prepared for onward transport within Europe. Military officials said they treat the deployment as a large-scale exercise meant to stress logistics skills that would be needed in case of a war on the continent. That means soldiers will be working against the clock to measure how quickly such a deployment can be accomplished. For some of the equipment, planners have devised a leg using inland waterways from Antwerp to Mannheim, Germany, to test an additional mode of transport besides road and rail, a U.S. Army Europe spokeswoman told Defense News. Trains are scheduled to be on hand in Mannheim for the rest of the trip east. Of the 1,000 wheeled vehicles to be transported, officials told the German population to expect 280 on the country’s road network, spaced out into smaller columns. “Military movements may temporarily disrupt road and rail traffic,” a U.S. Army Europe statement reads. Adding to the traffic uptick is a simultaneous deployment by the 2nd Cavalry Regiment from the Bavarian town of Vilseck to partake in exercise Sabre Strike in Poland and the Baltics from June 3-15. The United States will contribute 12,500 troops out of a total of 18,000 participants to that drill. 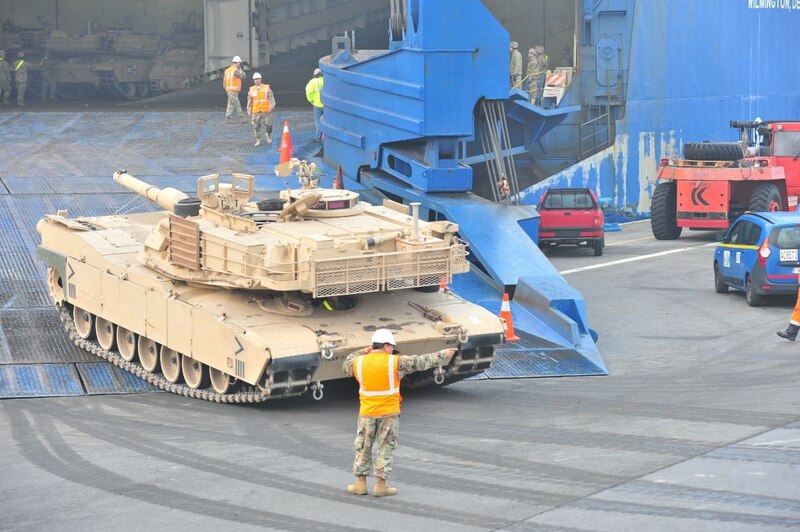 Once the new kit is in place for Operation Atlantic Resolve, the 2nd Armored Brigade will pack up to squeeze in some time at the Grafenwöhr Training Area in Bavaria before heading back north in Germany to ship out via Bremerhaven port, according to the spokeswoman. Operation Atlantic Resolve, carried mostly by the Americans, is meant as a show of force near Russia’s border with Europe. The initiative goes back to Moscow’s annexation of Crimea from Ukraine in 2014, leading to fears in Europe that Russia could attempt similar land grabs from its former Soviet satellite states.